Biola Student Population: Who Goes Here? Diversity can be somewhat of a buzzword among both college admissions officers and students. For the purposes of producing diversity scores, College Factual defines diversity as the most plurality. Schools that rank high in diversity metrics are those with the greatest variety in ethnicity, gender, age, and geographic location of origin. Get Started Learning About Diversity at Biola, and how it is Similar to Other Schools in the United States. The total diversity grade is created by adding up individual factors of ethnic, geographic, gender and age diversity. Biola University is thought to be above average in overall diversity, and is ranked #411 nationwide. Many college students value the chance to meet and learn from different racial and ethnic groups, which is more likely to happen at a diverse school such as this one. Biola University is ranked #303 in ethnic diversity nationwide with a student body composition that is far above the national average. 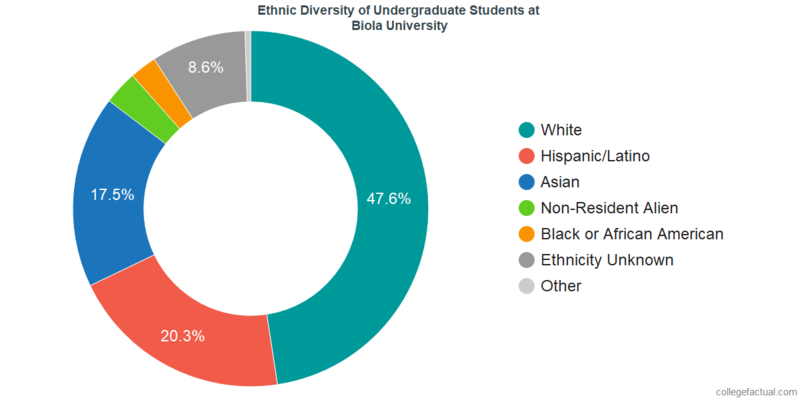 If the data is present, the following chart will show Biola undergraduate student diversity. 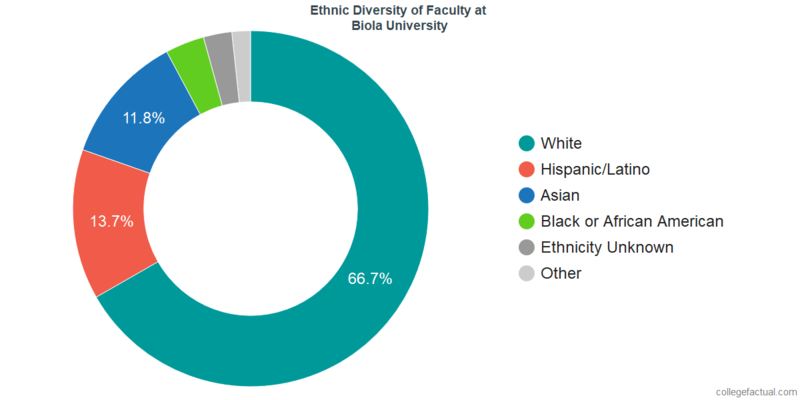 Biola boasts excellent ethnic diversity. If you're seeking an institution with an equal balance of male and female students, this may not be the choice for you. At Biola University, the disparity between men and women on campus is higher than the national average. 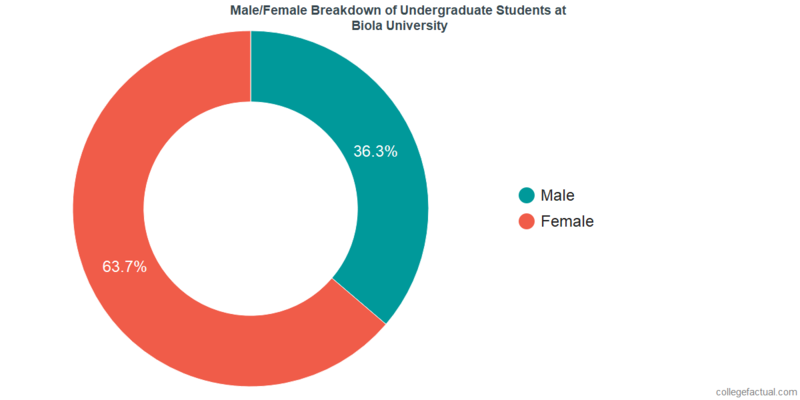 The undergraduate student body at Biola is mostly female. This university is ranked at #1,551 in male to female diversity nationwide. The undergraduate population is comprised of 1,483 males and 2,608 females. If available, the chart below will include the male to female ratio among Biola's undergraduate students. 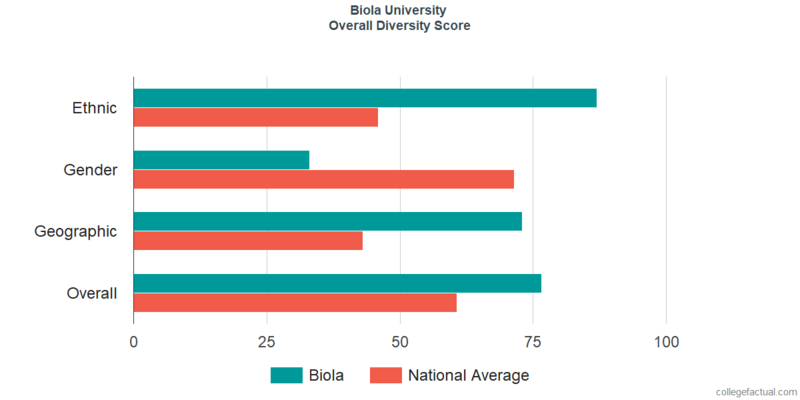 The disparity between the counts of men and women at Biola University is higher than the national average. If available, the chart below will include the male to female ratio among Biola's faculty. The ratio of male to female faculty at Biola is excellent. We looked at where each of the school's admitted students lived before attending to come up with the geographic diversity ranking. 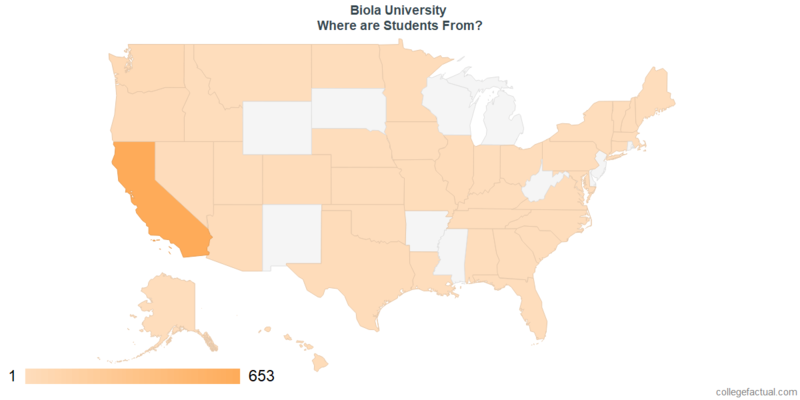 About 75.8% of the students attending Biola University come from within California. Biola's rating of #548 puts it above the national average. The undergraduate student body is split among 36 states (may include Washington D.C.), as shown in the chart below. There is a medium sized community of about 291 international students at Biola University representing at least 25 countries. Go to the Biola International Student Page for more information. The typical student is between the ages of 18-21. 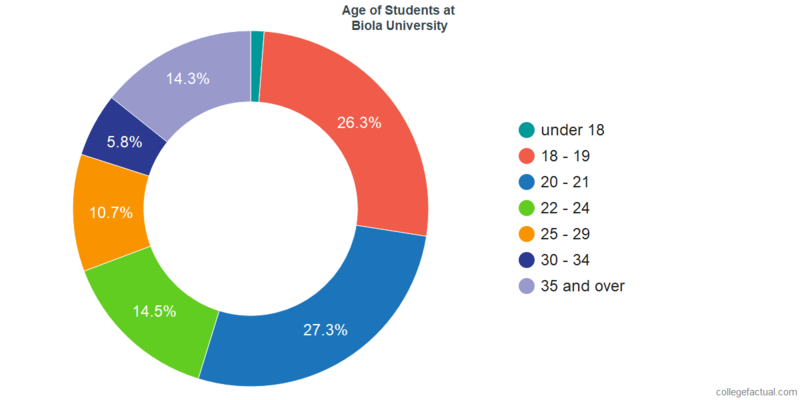 At Biola University, 54.7% of students are in the age 18 to 21 bracket, compared to the national average of 60%. We rank Biola #916 in the nation for student age diversity. The chart below displays the age range of the student body at Biola. Often when we speak of diversity, which is simply defined as "variety", what we mean is multiculturalism, or the acceptance of people of different ethnicities, races, cultures, beliefs and economic backgrounds. Diversity can be a huge benefit to students, as it not only exposes them to new ideas and ways of thinking, it prepares them for the diverse workforce of tomorrow, in addition to inspiring creativity and innovation. How is Biola doing at attracting and supporting students from all income levels? Even a school with high racial, ethnic and geographic diversity may not be diverse when it comes to the financial backgrounds of their students. To get a better idea of how Biola is supporting low-income students check the Financial Aid Page. How important is diversity to Biola? Diversity can be promoted by the college in multiple ways. For one, institutions should be making an effort to hire a diverse faculty to teach students. But the school should also be doing the best they can to encourage meaningful interactions between people from differing backgrounds. This prevents faculty and students from becoming isolated and promotes positive connections.